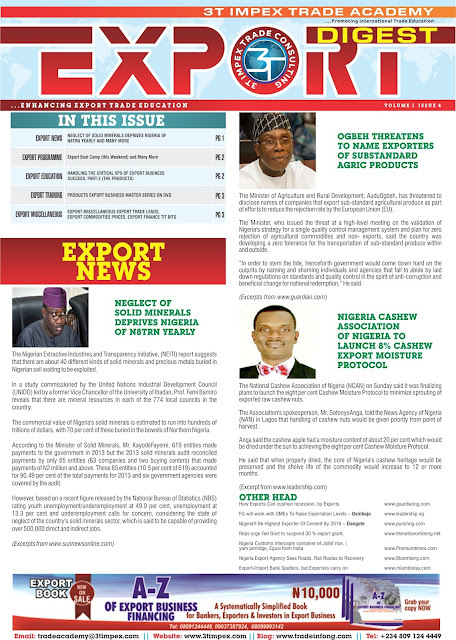 Doing business in Nigeria has never been easier. Get yourself ready for export trade training in Nigeria with the best export information on Nigeria Trade Info Portal. In our aggressive drive to grow the non-oil export volume from Nigeria, 3T Impex Consulting Limited has recorded another milestone via the recently signed MOU with a UAE based company Epoch General Trading FZE to buy Hardwood Charcoal from Nigeria. 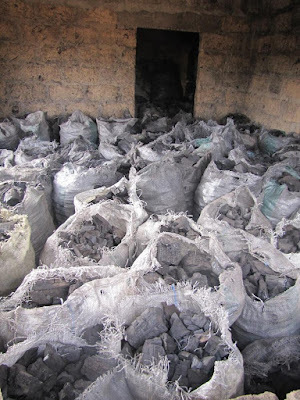 This has created a huge market opportunities for the Exports of Charcoal across Nigeria. The minimum contract volume is 10 container (190MT) and it is valid for 6months. 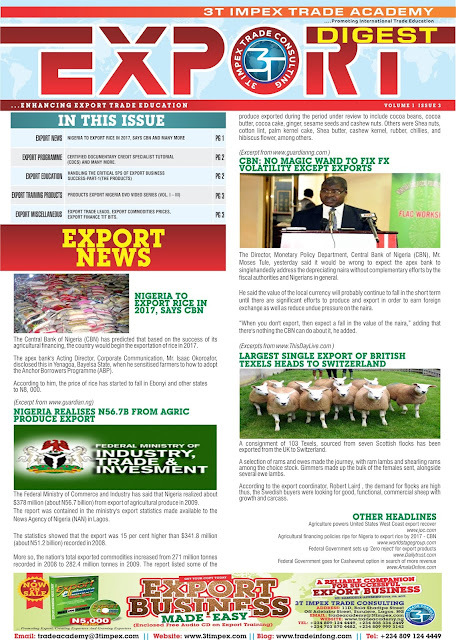 Get upto date News in this Edition of Export Digest Newsletter. Bamidele Ayemibo is the lead consultant at 3T Impex Trade Academy and has numerous trade certifications (ITS, CSDG, CDCS, etc). He has a decade of trade experience within and outside the Banking sector. 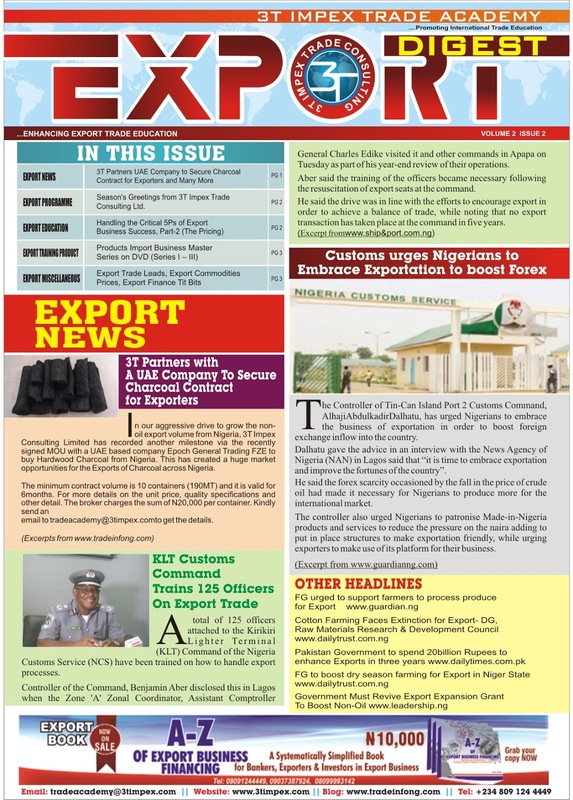 He was one of the few Nigerian contributor to the 2010 and 2012 Global trade finance survey, the Columnist of Export Matters on The Nation Newspaper, author of Export Business Made Easy and the host on a radio programme tagged Import-Export Helpline on Inspiration 92.3 FM every Thursday by 5pm. He is the first Certified Specialist in Demand Guarantee (CSDG) in Nigeria and among the first 10 in Africa and he trained more than 70% of the currently certified trade finance specialist in Nigeria. 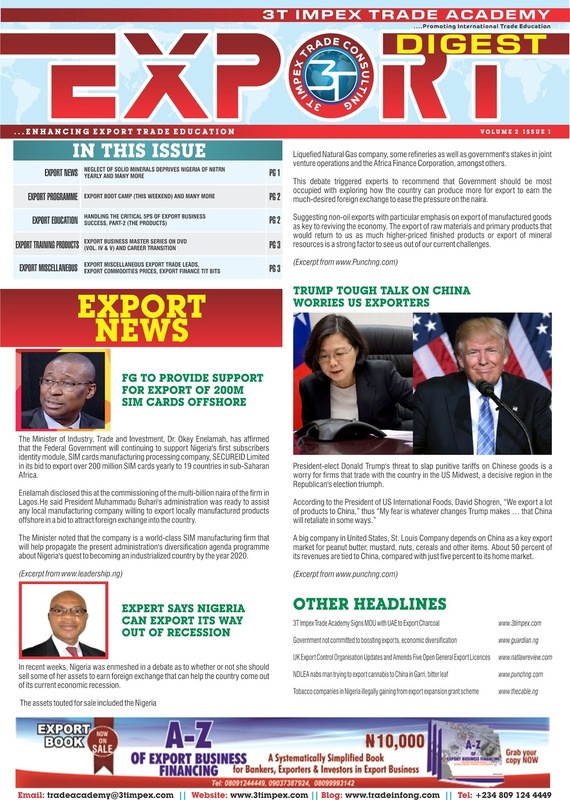 He has a very rare combination of expertise in international trade finance, trade rules, banking background and trade execution experience (www.3timpex.com). 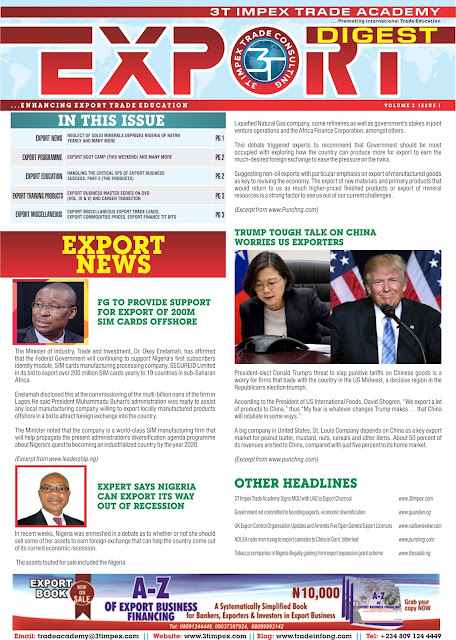 He is an avid blogger who regularly post export related information on www.tradeinfong.com. He regularly facilitates international trade finance related trainings for the Fidelity bank, Central Bank of Nigeria, Chartered Institute of Bankers of Nigeria (CIBN), First Bank Plc, FCMB, Heritage Bank, Ecobank to mention a few.